COLUMBIA, MO — Gene Policinski, senior vice president and executive director of the First Amendment Center at Vanderbilt University, has been chosen to deliver the keynote address at the 2012 FOI Summit May 11 and 12 in Madison, WI, the National Freedom of Information Coalition (NFOIC) announced. The annual FOI Summit, a national conference held in collaboration with the Society of Professional Journalists (SPJ), will be held at the Madison Concourse Hotel and Governor’s Club in downtown Madison. 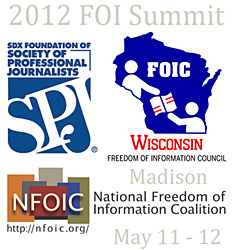 NFOIC is partnering with the Wisconsin Freedom of Information Council (WFOIC) in hosting this year’s Summit. “The program is shaping up and we are excited to have Gene to headline a distinguished array of speakers and presenters,” said Kenneth F. Bunting, executive director of NFOIC. The list of confirmed speakers and presenters for the Summit include civic and government leaders, as well as experts on open government issues and the First Amendment. Mike McCabe, executive director of the Wisconsin Democracy Campaign. Planned panel and program topics include fighting FOI erosion at the state and federal level, transparency in the post-Citizens United world, the impact and issues surrounding instant digital photography as a source of public information, and the troubling practice on the part of state governors to keep their schedules hidden from citizens and journalists alike. A nonpartisan alliance of citizen-driven nonprofit freedom of information organizations, academic and First Amendment centers, journalistic societies and attorneys, NFOIC traces its origins to national assemblies that state freedom of information (FOI) advocates held in Dallas in 1989 and 1991. Past years have seen Summits in Arlington, VA (2010), Minneapolis, MN (2009), Philadelphia, PA (2008), Seattle, WA (2007), and Indianapolis, IN (2006). Last year’s Summit was held in Providence, RI. Visit the 2012 FOI Summit homepage for additional information and online registration.